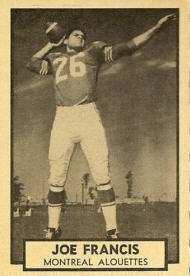 Joe Francis played quarterback at Oregon State from 1954 ti 1957. 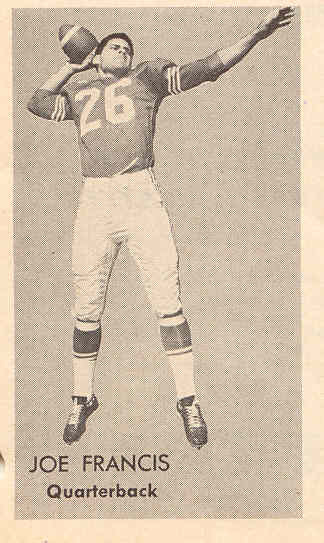 Francis played halfback and quarterback and was at halfback for the Beavers in the 1957 Rose Bowl loss to Iowa.. Francis was drafted in the fifth round of the 1958 NFL college draft by the Green Bay Packers and played two seasons (1958-59) for them. With Bart Starr qt quarterback, Francis didn't see much action with the Packers and came North to play t two seasons i nthe CFL with the Montreal Alouettes from 1961 to 1962. A knee injury limited Francis to just three games in 1961. Following his laying career, Francis returned to Hawaii where he was born and worked as a phys-ed teacher and high school football coach. Joe Francis passed away on April 15, 2013.